Cheryl-Lyn's Café in Adelaide Street, Maryborough has become the place to go for great coffee, morning teas and lunches along with entertainment on Thursdays and Saturdays by local well-known artist Kevin Gray. Cheryl-Lyn has many years of experience in the catering industry, having owned other cafes and run kitchens for proprietors previously in the heritage city, so it is no wonder her business is prospering and filled with clientele during the week and on Saturdays. 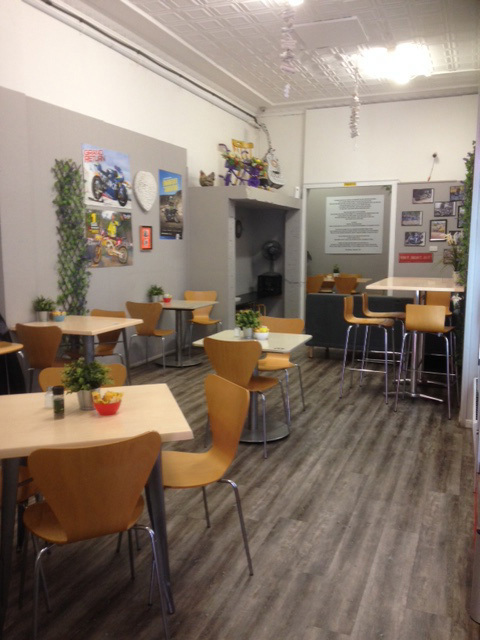 Although the café is not open to the public at night, if you have a special occasion or involved in a club that would like a venue to meet, Cheryl-Lyn is happy to oblige with the place and catering. The café is very inviting with lounge style chairs towards the rear and a smaller room suitable for private functions, girls' get-togethers, birthdays etc. Locals are invited to bring in their photographs to hang on the walls, creating a warm family atmosphere within. The tables are spaciously arranged so your conversations and meals can be private. There is no need to worry if you have special dietary requirements as thirty per cent of Cheryl-Lyn's customers are gluten intolerant. Vegan choices are also available to order. All sweets are homemade either by herself or her partner, who is a baker. On the day I visited with friends, we ordered four completely different meals, which included a Coconut and Berry Pancake, Ruben Sandwich, Grilled Chicken/Salad and Prawn Cutlets/Chips & Salad along with coffee and juice. Your choice may still be the quick and easy toasted sandwich; however, the variety of meals offered is evident from the menu. Situated in the middle of the CBD, the cafe is close to banks and chemists and also in close proximity to the festivities that occur each Thursday for Maryborough's Weekly Market Day, when the Town Crier and Mary Heritage appear for the firing of the historic time cannon at 1.00pm. 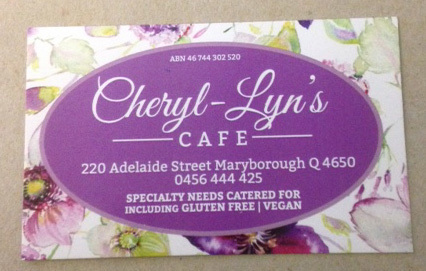 Next time you are in the Maryborough, pop into Cheryl-Lyn's, you won't be disappointed with the service and meals are top class. 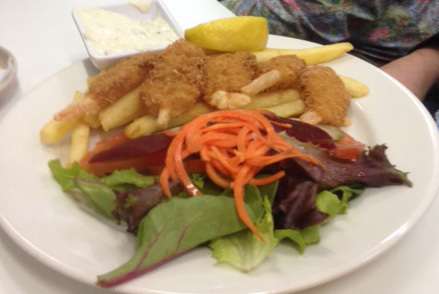 The café is located at 220 Adelaide Street Maryborough CBD. If you are wanting more information you can call 0456 444 425 or send a message through their Facebook page. What's Gloria Jean's Best Beverage?